As I notice that this magazine is joining every other design magazine, school and website in hosting a design conference, I am compelled to ask: What the hell is going on? Why does everyone want to hold a conference all of a sudden? Is it that design conferences have been such wild successes that we’ve suddenly realised that within every great designer lurks a great performer waiting for his (or, more rarely, her) moment in the spotlight? I think not. In fact design conferences tend to be frantically interdisciplinary, pulling in scientists, entrepreneurs and comedians to keep us entertained between design show-and-tells that might be more effectively presented in other formats. Is it that there are issues in design so pressing that they demand a live summit in order to chart a bold new course for the profession? Perhaps. But then do we need so many summits to chart so many new courses? Isn’t the idea of a summit that it is a singular event meant to rally the masses under a single banner? Shouldn’t Eye support an existing conference? I understand why conferences seem tempting: invite designers to show their work and get sponsors to host some parties. The presenters benefit from the free publicity. The audience gets to see inspiring work and meet the people behind it. And the organisers stand to make some money. You may even pick up ideas for articles. Having worked behind the scenes at several conferences, however, I can assure you that they are miserable. I can only compare it to being a steward on a cruise ship – except without the bountiful buffets and open bars that keep passengers docile. Designing a conference is a massive endeavour that is similar to creating a new civilisation: it requires symbols and artefacts, common causes, pecking orders, and it breeds dissent. Not to mention the physical infrastructure: the average attendee uses the toilet approximately three times a day. Even organisations with decades of experience rarely pull off a successful conference – which, ironically, may be one reason why so many others are now attempting them. I know that pulling this magazine together is no mean feat; but at least words and images stay where you place them. They don’t slip out the back to have a smoke every time you turn around or decide they’d rather go for a pint with their mates than hang out with the advertisements. The editor replies: Thanks for your concern, David. To put your mind at rest, Eye conference no. 1 has been postponed. However, we plan to host a series of events – debates, talks and social occasions – instead. 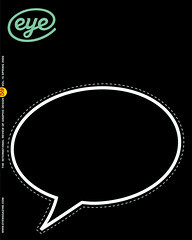 Please join our mailing list (go to eyemagazine.com and enter your name) for up-to-the-minute information.